CLARK COUNTY — Students at one more Clark County school district could be headed back to class soon. The Washougal Association of Educators this evening confirmed that they have reached a tentative deal with the school district on a new contract. The 200 teachers that work in Washougal are scheduled to meet at 9 on Thursday morning to vote on whether or not to accept the deal. Details haven’t been released, but the district’s most recent offer would have represented a nearly 19 percent increase over last year, putting the salary range between $51,522 and $95,783. Meanwhile, teachers in Evergreen and Battle Ground school districts remain on strike, with classes canceled for a sixth day on Thursday. Unions representing teachers have accused the bargaining teams on the other side of the table of refusing to relinquish all of the extra funding sent over by the legislature this year in the McCleary funding fix. Those districts insist they are handing over not only all of the McCleary money, but dipping into their reserves and putting themselves in danger of running into budget problems within a year or two. In a release on the Washougal School District page, they attempt to explain that, while the district did get an additional 26 percent from the state this year, some of it was meant to replace the 16 percent Time, Resource, and Incentive (TRI) pay teachers received above their base salary. The Washington Supreme Court mandated that, in order for the state to be fulfilling its constitutional obligation to fully fund basic education, districts could no longer dip into local levy money to compensate teachers. That money, starting in 2019, can only be used to pay for additional educators beyond what the state funding covers, as well as added programs and school staff. Some money can go to teachers for extra work, but it has to be documented and tracked. In Battle Ground, the district’s latest announced offer spread a 20.3 percent raise over three years, including 11 percent this year. The union, reportedly, has been pushing for a one-year deal with a 19.7 percent raise. The Battle Ground Education Association alleges that the district is seeking to keep $4.5 million of the $9.6 million dollars the state sent them. The district counters that it is spending all of the new state money, in addition to nearly $5,000 per teacher out of the district’s own money. They claim that number would increase to $8,342 by the third year of the contract, and present the district with a funding crisis that could see staff or programs cut in other areas. Teachers in Evergreen school district are currently under contract, but negotiating a salary increase based on the additional funding from the state. The district says it is offering all the McCleary money, with an additional $11,561 per teacher in local money, for an average wage of $80,690. The Evergreen Education Association has not released its most recent proposal, or a range of what they’re seeking. They have simply said that the district is not spending all of the money the legislature earmarked for teacher salary increases. 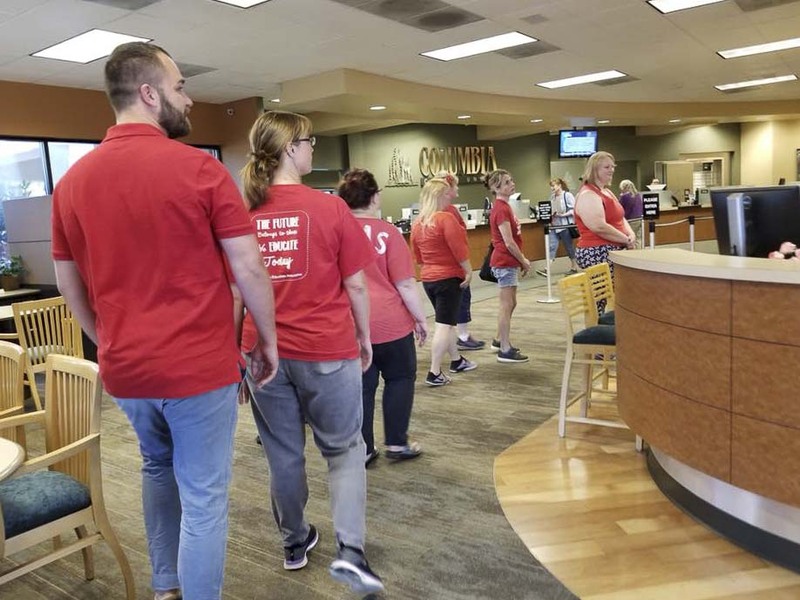 With an agreement with its certificated teachers out of the way, Vancouver school district is gearing up for negotiations with the union representing their classified workers. Pat Nuzzo with the district says it’s been a rough few months, trying to make sense of what the legislature did. “I think that there’s definitely room for improvement in the funding model,” she says. Part of it, Nuzzo says, is the misunderstanding that all of the additional $1 billion the legislature approved to fund education this year was specifically for teacher salaries. Vancouver teachers actually agreed to a new contract with smaller raises than most of their neighboring districts. Even so, Nuzzo says it’s likely the district will be left with some difficult choices going forward. That’s a common refrain from other districts as well, including Ridgefield, Camas, and Hockinson, where teachers have also agreed on new deals. It’s becoming increasingly likely that lawmakers will face a backlash when they return to Olympia next year for a longer session, and that their years of work to fully fund basic education may have opened a whole new can of worms. “The district is committed to working with the state and the legislators to try to correct the way that the money was passed down to school districts which, we believe, started this problem throughout the state,” says Nuzzo. One option could be lifting the cap on local funding levies, a compromise that was being floated even before the legislature’s second special session adjourned earlier this year. That would, of course, be reflected in the pocketbooks of property owners throughout the state, who are already on the hook for over $8 billion next year in education spending, just at the state level. With the legislature approving a one-time property tax relief bill as well this past session, it’s unlikely to be a popular option for legislators to look at possibly undoing that. ClarkCountyToday.com has issued requests to a number of local state lawmakers, and will gladly post their thoughts should they decide to share them.